We have been struggling to decide on a meat. While the hubs and I love turkey, none of our kids do. But, they do absolutely adore this applesauce pork tenderloin. Cooking a pork loin with applesauce in a pressure cooker does have some tricks as the sauce can thicken in the Instant Pot causing a burn notice. 1. Dilute the sauce with 1/2-1 cup of water when cooking the pork loin directly in the inner pot. Flavor is just as delicious, the sauce is just thinner. 2. Use the pot in pot (PiP) method. I personally prefer using a silicone loaf pan when we make pork loin, but any inner pot will work. If you used stackable pots you could make an entire meal! If using a stackable pan put the meat (or the thickest item you are cooking) in the bottom pan. Turn Instant Pot on sauté. Allow the inner pot to heat up. Combine applesauce, honey, Dijon mustard, and rosemary leaves in a small bowl and stir to combine. Season with salt and black pepper, to taste, and set aside. Add cold coconut oil to the inner Instant Pot pot. Generously season the pork roast with salt and black pepper, to taste. 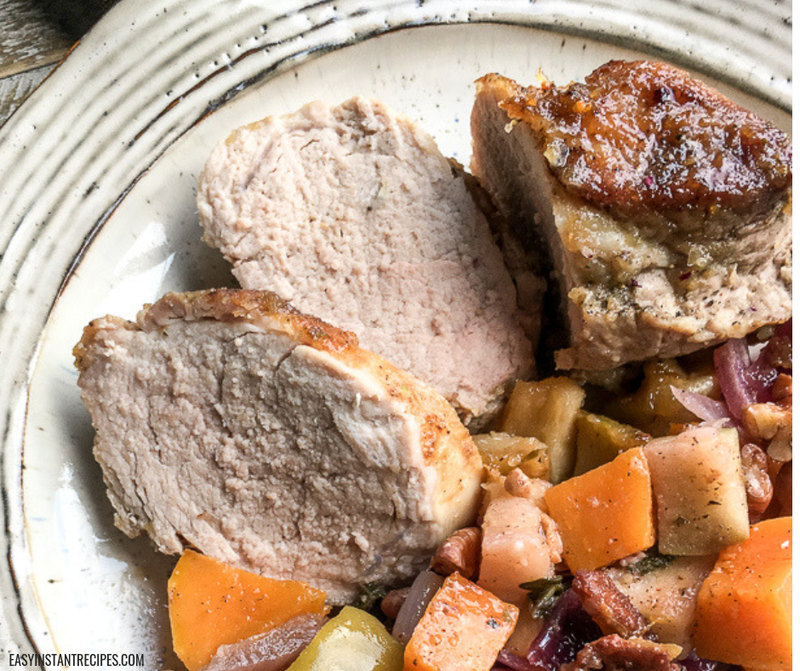 Cook the pork roast in the Instant Pot until browned and evenly seared on all sides, approximately 5-10 minutes. Remove from heat. Place the pork roast in a pressure cooker safe loaf pan or stackable pan. Place the pan with the pork roast into the Instant Pot with 1/2 cup of water beneath it. Use the insert to stabilize the pan if needed. Lock the lid on the Instant Pot and seal the vent. Pressure cook on "High/Manual" for 30 minutes. Once done cooking allow the pressure to naturally release for 10 minutes and then quick release the remaining pressure. If using a larger pork loin, cut in half and divide into two stackable pans before pressure cooking. The applesauce mixture is too thick to cook in the pressure cooker without inner pans. You can dilute the mixture with water if desired to cook straight in the Instant Pot inner pot. Flavor will be the same although the sauce will be thinner. Not making this pork tenderloin with applesauce in your pressure cooker right this second? Then pin this post so you can easily find it later!